We’ve talked about decluttering and home organization room by room, so today on Tips for the Uninspired Homemaker we’re going to talk about the benefits of an organized home. Now, you may be thinking that this is pretty common sense- and to be perfectly honest, it is. Having an organized home means that you know where things are and that you aren’t having to search for them constantly. 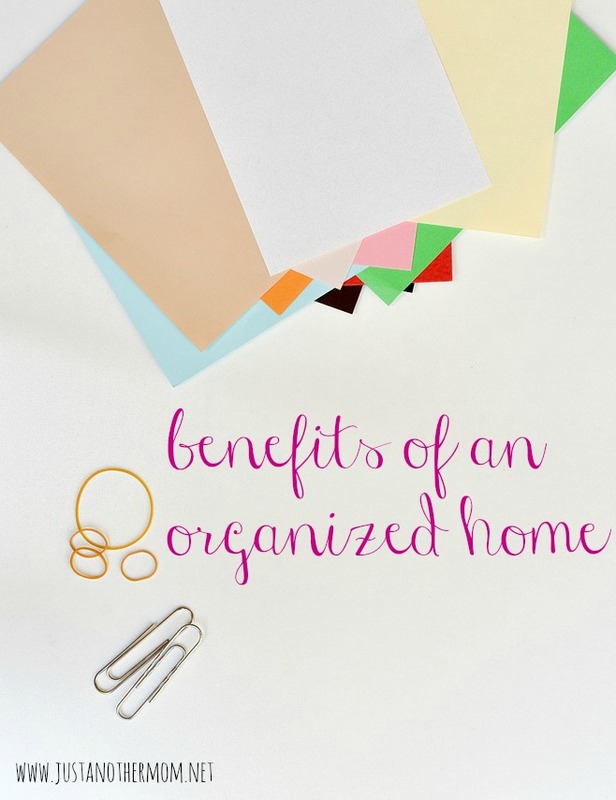 But what are other benefits of an organized home? For one thing, being organized helps you find things. This can be a huge time-saver! Knowing where things are saves time and frustration. Lost items can have a ripple effect, too. If you’re so distracted over the lost item, you may end up forgetting even more. Kids’ rooms with organized toy bins also make it easier on everyone; you’d be less likely to have to go back into your child’s bedroom in the middle of dinner preparation, for instance, to help them find a favorite toy. Being surrounded by unorganized clutter can, according to some experts, have an effect on the brain that is not unlike that incurred from trauma. Your brain finds clutter stressful, in other words, and responds with such negative feelings as anger, depression, and frustration. Clutter is hard to clean. Dirt and dust accumulate around and between cluttered objects, making for a rather unhealthy environment. And if you have pets, animal hair can find its way in and among disorganized objects, which may set the stage for allergies. Another thing to consider is insect pests. Bugs like silverfish like to get in among books and other paper clutter to make their homes. Other vermin like clutter as well, such as mice and even cockroaches. Organizing and cleaning go hand-in-hand; you can’t have one without the other! So getting things organized can minimize these unhealthy conditions. Another way that organizing your home contributes to health is with regard to meals. If you are organizing and planning your family’s meals, they are likely to be a lot healthier than if you are grabbing something last-minute from the drive-through or freezer. Are you hesitant to have people over because of your messy house? One of the benefits of organizing your family’s home is that it becomes a more inviting home. You’re not ashamed of it, so you will be more likely to ask friends and family over. Who doesn’t want to do that? It seems there’s never enough time! In an organized home, you will feel more energetic and less bogged down with all the clutter, and that leaves time for enjoyable activities. Sometimes, you feel like you really should be tackling the clutter and mess, and therefore you don’t do as many pleasurable things…but you don’t get around to organizing, either! Just going ahead and getting it done helps break that cycle. What else do you think are benefits of an organized home?